Delightfully drawn and packed with both personality and innovative game ideas, but more tiny than big. This game has an obsession with pants. Your objective is pants, pants are used to open doors, and there are massive frescoes of pants painted all over the walls. But let's rewind a moment. Tiny & Big: Grandpa's Leftovers is a platformer where almost any block in the game can be sliced in half. The left mouse button activates a laser that chops a flat plane through any object, the right mouse button summons a grappling hook that you can use to tug sliced blocks around, and the middle mouse button attaches a booster rocket to send objects flying. It's a game where you literally carve your own path, slicing steps, ledges and platforms. You play the eponymous Tiny, and you're chasing after Big, who has stolen... pants. The pants have given him tremendous power, but they're also slowly corrupting his mind, making him hurl rocks, boulders and other obstacles at you as you pursue him to try and get the pants back. 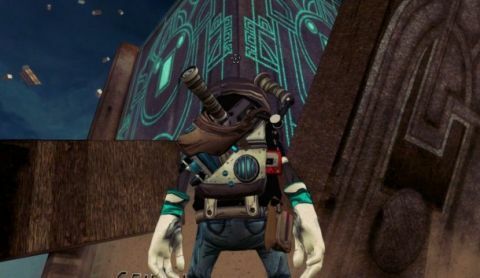 All this is rendered in an adorable hand-drawn art style, reminiscent of Psychonauts in places. Great big cartoony sound words like 'KRUMP!' and 'POK!' jump out of the terrain as rocks hit the ground, and the characters are stuffed with personality. But the physics is the game's greatest achievement. Tiny & Big goes out of its way to put you in situations where lasering things in half feels awesome. It might be toppling an enormous pillar. It might be slicing through a huge rock aimed at your head. It might be running up a ramp while boulders cascade down from above. In later stages it gets even more impressive. After clambering up the outside of an enormous pyramid, you're asked to descend into its dark interior, teetering on precarious ledges and lasering away beams from the ceiling to act as bridges to take you down to lower levels. In every case, it's difficult not to be awed by the scale. The downside to such open-world levels is the risk of getting lost. The maps are scattered with collectible 'boring rocks', which are supposed to provide a breadcrumb trail showing you roughly where to go. Nevertheless in a few cases I got stuck, and the only thing that reorientated me was the game's (mostly excellent) checkpointing. It became a case of wandering around for a bit, then hurling myself off a cliff to see where I respawned. The only other complaint is the game's length. Even after getting lost a bit, I completed Tiny & Big in about two hours – which is pretty short, even for a game that costs £7. Challenge modes help to make it replayable, asking you to complete a level with a set number of cuts, but ultimately this is a dense, brief experience – not one that sprawls. Neither of these things detract from the game's core pleasure of block-slicing enough to dock it too many points, especially as this is supposed to be an episodic affair. Buy it, enjoy it, and then look out for episode two.